Point of Sale (POS) systems are a modern-day feature at businesses of all sorts, from clothing stores to food carts to hardware stores. They allow businesses to manage sales and to collect and analyze data on customers and inventory at an unprecedented scale and develop better strategies for marketing. On the backend, POS software records all sales transactions and keeps the data stored on the cloud or in the POS terminal that runs the software—usually a tablet or similar device. Many software programs allow for users to manage the data remotely. The data they handle includes sales, accounts payable, inventory, shop management, customer tracking and follow up, payroll and automatic price updates. For restaurants, this software allows businesses to run several open tabs at any given time and to split or merge them if needed. It can tell you in real time which menu items are selling well and which ones are duds, to help waitstaff pivot their upselling accordingly. For payroll management, it tracks your busiest times of day with a sophisticated analytics dashboard so you know when to staff more employees. Now, not all POS software is created equal. Before deciding which software to purchase, it’s important to weigh the various features and determine if they answer your needs. First let’s start with pricing. Typically POS software companies charge per register. ShopKeep​​, for example, charges $69/month for each of three registers and then $29 for each additional one. Revel, another industry leader, has a sliding pricing scale from $70-200/month, depending on what the particular business needs. TouchBistro​ charges $69/month for a single platform, $249/month for five, or $399/month for unlimited platforms. Upserve​ starts with a per platform rate of $99/month and offers a “pro” package for $250/month. It also offers “prix fixe” plans, that include the hardware and software for $349/month and up, depending on the features you select. Harbortouch​ offers a base package at $69/month for each platform, though there is also an added software support fee of $60 billed quarterly. ShopKeep has an intuitive and user-friendly interface which is easy to operate. The software works on an iPad and is cloud-based, though it can operate offline if needed. It allows users to split tickets and attaches different tax rates for items as needed. It has a sophisticated reporting and analytics system for keeping track of data, and 24/7 customer service available by chat, phone or email. In addition, users get access to email service provider MailChimp, which provides targeted emails to customers. With its higher prices and more extensive options, Revel is better suited to larger businesses that need the extra features and can invest the funds needed to make it work. Its system quickly crunches all types of figures including multiple tax rates, surcharges and service fees. It updates inventory in real time and allows for easy, instant modifying of multiple orders. Revel also does great with bookkeeping, automatically transferring data to a QuickBooks account. Employees can receive a unique PIN login to track their hours and sales. The software also allows for the iPad to be used as a self-checkout counter for customers to place orders and pay bills. Also, the “kitchen view” option sends orders to the back of the house where they can be seen and managed by cooks and servers. TouchBistro is a cloud-based POS that prides itself on having been designed by food service workers for use in restaurants. This past year Business News Daily voted it the best POS for restaurants. TouchbBistro is designed to streamline the ordering process between the front and back of the house and the entire system is built around allowing users to quickly and easily customize menus and manage the floor. It allows for unlimited users—perfect for big restaurants and their ever-changing cast of servers—and can be set up to allow tableside ordering, which gets the orders back to the kitchen instantly. Among other time savers, it provides easy one-touch bill splitting and seat joining, which give servers some relief. Unlike with some other POS software providers, with TouchBistro you get the same features no matter what you pay, with users charged solely on the number of licenses they use. 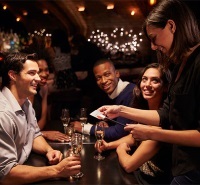 Upserve is another POS system tailor-made for the hospitality industry. In 2016 it bought out Breadcrumb POS, a cloud-based system which was designed by former food service workers. 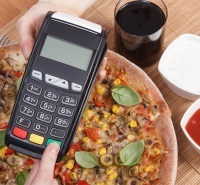 The system is engineered to allow tableside ordering and payments and can be operated even if it goes offline. It has a simple interface that is easy on the eyes and can arrange everything from table management to order-taking to printing checks and taking payment. The Echo and Elite software that runs Harbortouch POS is geared towards streamlining business management. Echo is a more simplistic system, and is tailor-made for basic retail, kiosks, and small food vendors. Elite is a more top-of-the-line option, and is geared towards casual and fine dining restaurants, bars and nightclubs, and advanced retail. Elite—which costs $69/month as opposed to $39 for Echo—can also accommodate online ordering, tableside ordering, and online reservations. For the higher price, a Harbortouch representative will custom program your system. Both systems track inventory and manages the workforce with built-in time clocks. Through its “lighthouse” desktop platform, users can operate their Harbortouch POS system remotely 24 hours a day, no matter where they are. It also has integrated built-in loyalty functionality in order to better target customers and offer comprehensive training and support to get employees up to speed with the system. Besides doing your homework on the different POS options, it is crucial that you determine what exactly you need for your business. 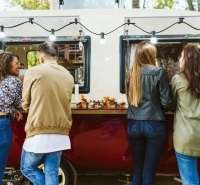 If you are a small takeaway cart or a kiosk, you probably don’t need the heavy-duty features of some of the more expensive POS systems, and it’s better to save your money and go with a simple, straightforward system. That said, with a more basic system you run the risk of not being able to scale accordingly if your business starts to expand. 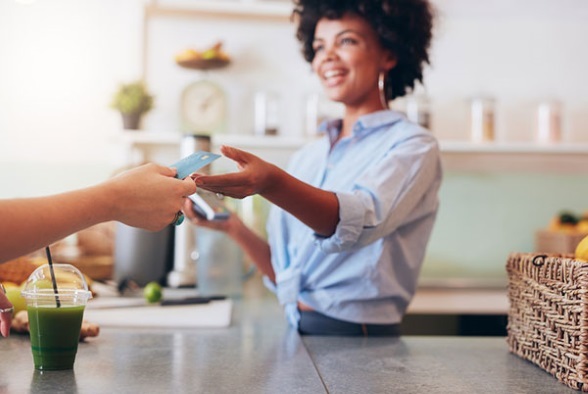 The bottom line, it’s up to you to decide which features are most important for your business, and which POS software will get you where you need to go. read more POS system review.